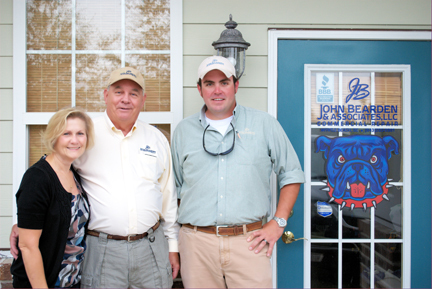 John Bearden was a custom home builder in Columbia and moved to Myrtle Beach in 1993 as the custom home business in Columbia was slowing down. He continued building large homes in this area until 2001 when he quit building custom homes and turned to construction defect and commercial repair exclusively. He has over 30 years of experience in the construction industry and plans to continue working in the Myrtle Beach area. Justin McCormick, John's son-in-law, is a Surfside Beach native and is also licensed as a Residential Homebuilder and General Contractor. Justin is the Projects Manager and constantly roams each job to insure quality and strict adherence to standards. Prior to joining John Bearden & Associates, LLC in 2005, Justin worked in restaurant management. He and his wife have a son who is often roaming the hallways in the office. Jayne Bearden, John's wife, is the company's book-keeper and has managed the office for over ten years. She often has one or two of their grandchildren with her at the office while she works. We have a long standing commitment to constant continuing education. I have over 30 years experience in various aspects of the construction industry and am currently licensed as a General Contractor and Residential Builder. Several years ago while building custom homes, I began receiving requests from attorneys to inspect homes for construction defects and prepare estimate for the repair of those defects. I began repairing those defects and occasionally, doing maintenance work for various management companies. My company recently completed a two year construction defect project at Magnolia Place on time and within the budget. I still work for various attorneys involved in construction defect litigation and provide inspections, estimates and testify as an expert witness. As such, I am fully aware of the standards mandated by the building codes and the need to adhere to those standards. My goal is to provide quality service whether providing general maintenance, commercial and residential repair, commercial and residential inspections or water and termite damage repair. My employees are experienced in carpentry and waterproofing and have many years of construction defect repair, termite, rot and water damage repair behind them. My Project Manager, Justin McCormick, is a young man whom I have known for over fifteen years. Justin is currently licensed as a Residential Home Builder & General Contractor and is studying for his degree in Construction Management. Justin and I are wholeheartedly committed to providing you with professional service in a timely manner whether your job is large or small. Several years ago, while building large custom homes, we began receiving requests from various attorneys to inspect homes and buildings for construction defects, prepare estimates for the repair of those construction defects and testify in court as an expert witness. Soon after that, some of our clients asked if we could also repair the construction defects and occasionally, provide maintenance work for various Home Owner Associations (HOAs) and management companies. In 2001, we quit building custom homes and have devoted our work exclusively to construction defect repair, commercial repair and maintenance. We have worked for various attorneys involved in construction defect litigation in providing inspections, estimates, and testifying as an expert witness. As such, we are fully aware of the standards mandated by the building codes and the need to adhere to those standards. Sometimes an attorney will call us requesting that we inspect a residence or condominium project for construction defects and sometimes an individual homeowner or condominium owner will call. If we do find evidence of construction defects we can prepare a report and inform the attorney, homeowner or homeowners association of the potential problems. If requested, we can provide an estimate of the cost to repair the problem and complete the repair. While providing construction defect repairs, we were approached regarding providing maintenance services to HOA's, roofing and providing insurance estimates and repairs and added those services. Whether we provide general maintenance, commercial or residential repair, commercial or residential inspections or water and termite damage repair, our goal is to provide quality work. 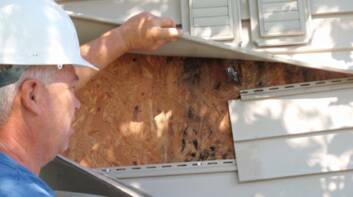 Our employees are experienced in carpentry, waterproofing, painting, roofing and have many years of construction defect repair, termite, rot and water damage repair behind them. We know how frustrating it can be to build a new home only to find that your new home has been damaged due to construction defects. We understand how it feels to move into a condominium so that you will not have to deal with exterior maintenance only to find that your residence has construction defects and has suffered water intrusion and termite damage due to the defects. We want to help you find a solution to your problem. Please call us today and let us help you. of the close ties we share.